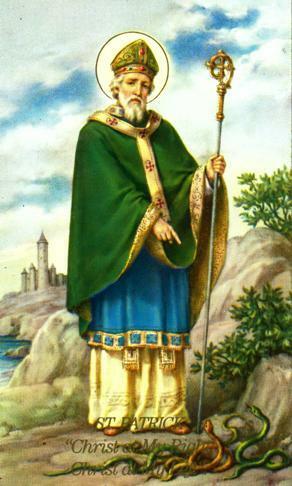 This entry was posted in History, Medieval Ireland, Popular Delusions and tagged Apocalypticism, Bishop, British Isles, Celtic Christianity, Christianity, History, Ireland, Irish, Irish people, Medieval History, Medieval Ireland, Palladius, Religion and Spirituality, Saint Patrick, Saint Patrick's Day, Shamrock. Bookmark the permalink. 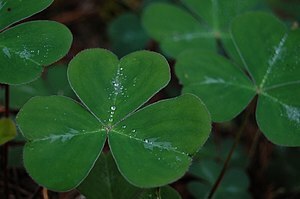 That’s all well and good, but it’s a scientific fact that there are shamrocks in Ireland, and it’s also been proven that there are no snakes in Ireland. These simple observations undermine a good deal of your argument. You wouldn’t happen to have a source for the theory about St. Patrick being on a mission to bring about the apocalypse, do you? I’m trying to do a write up about him and I want to mention that but I don’t want to do it without a source. Vol. 14, No. 1 (Jan. – Feb., 2006), pp. 16-19, http://www.jstor.org/stable/27725390, and for a more detailed approach, Discovering Saint Patrick (London, 2005), and Celtic Theology (London, 2000), all by Professor Thomas O’Loughlin of Nottingham University. It must be said, though, that this apocalypsism on behalf of Patrick is conjecture, there is no way of knowing for certain that he held such a belief. It is likely, as such beliefs were very common in the Middle Ages (and still are in certain parts of the world today), but not certain. O’Loughlin is a historical theologian, respected in the academic community, and his books are well researched. Investigate his footnotes and bibliography for his sources, but, annoyingly, some of his more bold statements are unsourced, so I would advise you to be ever so slightly wary of his grander theories in your work (the above essay is not of academic standard, but such is not its purpose, so I didn’t critique the apocalypsism theories in any detail). And when writing any essay on early medieval Ireland, or reading for curiosity, I would encourage everyone to pick up A New History of Ireland. Vol. 1, Prehistoric and Early Ireland, edited by Dáibhí Ó Cróinín, and Early Christian Ireland by T. M. Charles-Edwards. I hope this has been of some small help to you. Beautifully appropo and hilarious all at the same time. Most religious legends are just the result of post hoc, ergo propter hoc. No snakes and shamrocks? Therefore it must have been jebus. Thank you. I do my best to make history entertaining, and to illustrate how religion was constructed, not ‘revealed’. I must offer one simple caveat to your comment about religious legends; the people who believed in such fantasies before the Age of Reason should not be looked upon disparagingly as they had no alternative explanatory paradigm. Their legends and myths were based upon cultural responses to various dilemmas reinforced by a limited understanding of the world they lived in; ‘God’ was probably a very real thing to Moses and his ilk, just as Thor may have been to the Norse peoples. In the later attempts of medieval ecclesiastical scholarship to explain creation, faith was the only option available, and the only valid form of evidence for them was the ‘truth’ found in religious texts. In their defense, many religious scholars were incredibly inventive, and did the best they could with what they had. I, however, offer only limited asylum to religion; since the late 16th/early 17th century faith is a redundant paradigm, yet it is clung to by millions, exploited by a slim minority. So, in my opinion, religious legends are valuable as they reveal to us aspects of creativity, political and theological machinations, cultural perceptions; they are windows to the past which can be far more illuminating about the lives of our ancestors than dry chronological records. On the other hand, anyone living who believes in these fairytales, well, I’ll be polite and simply say that I have little time for their simplistic and narrow world perspectives. An interesting and entertaining read. You strike me as a person who might enjoy Seán Ó Faoláin’s history of Ireland – a bit iconclastic when it comes to princes and lords and blokes of that nature. I have heard of Seán Ó Faoláin, but, I have yet to read any of his work. As for your challenge to the tale of the snakes, I was first flabberghasted at the audacity of the theory, and then surprised as, after a quick search, I have found evidence for your theory – http://ptl2010.files.wordpress.com/2011/03/st-pat-driving-snakes-out-723585.gif. Shocking. I am shocked.